I wrote a long introduction for this review, in which I acknowledged the greatness of Wilco’s 1996 album Being There, and also defended the honor of its predecessor, the band’s 1995 debut, A.M. But I scrapped it, for three reasons: 1. It was too long. 2. It was not focused on the meat of Rhino Records’ recent reissues of Wilco’s first two records, i.e. the unreleased songs, demos, alternate takes and live tracks. And 3. We don’t all have to agree that both Being There and A.M. rate an 8.5+ on a scale of 1 to 10. Nor do you need me to tell you how to feel about two records that are old enough to legally drink. Back to the reissues: A.M. is presented with eight bonus tracks, including the holy grail of either collection: the final song recorded by Tweedy’s pre-Wilco band Uncle Tupelo, heretofore rarely heard. It’s called “When You Find Trouble” and it was written by John Stirratt, bassist for Wilco and a member of Uncle Tupelo’s final lineup. Sharp Wilco fans will recall that A.M. also features a Stirratt number, “It’s Just That Simple.” “When You Find Trouble” feels like its close cousin, with similar pacing, prominent fiddle and an unremarkable melody that never really lifts off. It is, however, the last song Uncle Tupelo ever recorded, apparently, so that alone is worth something. Stirratt is responsible for another tune on the A.M. reissue called “Myrna Lee,” a gentle, twangy love song that’s better than both “It’s Just That Simple” and “When You Find Trouble.” This song was also recorded by Stirratt’s sister’s band, Blue Mountain, on their 1997 album Homegrown. That version is far superior to this one, and you’d be doing yourself a favor if you went and listened to Homegrown ASAP. Filler tracks here include early versions of Tweedy’s “Lost Love” and Bobby Patterson’s “She Don’t Have to See You,” both of which would later appear on albums by alt-country supergroup Golden Smog. And there’s an embryonic take on Being There highlight “Outtasite (Outta Mind),” which replaces the album version’s swagger for some unflattering rigidity. For Wilco fans, it’s a curiosity. No one else would’ve missed it if it stayed in the vault. 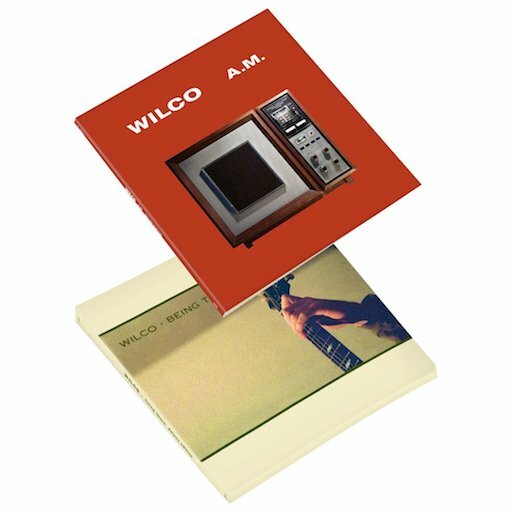 Rounding out the A.M. reissue are three unreleased Wilco songs: another old Stirratt rocker called “Those I’ll Provide” and a tune called “Piss It Away,” which could pass for an early version of A.M. highlight “Box Full of Letters” with different lyrics. The closer, “Hesitation Rocks,” is the most interesting of these three, in part because it sounds like Pavement if they were a Midwestern bar band. The dissonant guitars. The ba-ba-ba-da-das. The “Rattled By the Rush” riff. Maybe it’s wishful thinking on my part, but there are a lot of Pavement-y elements there. Now for the Being There reissue. It’s a five-disc set: two discs for the original album, two for live performances and one for odds and ends. The 20-track live set was recorded a couple weeks after Being There was released, right around the time Tweedy was wearing pajamas on stage and throwing deli meats into the crowd during encores. It was a wonderful version of Wilco, one that will never get together again after the death of former member Jay Bennett. So if hearing what Wilco sounded like in late 1996 interests you, you need this. Highlights include a punk version of “Passenger Side,” glorious noise anthems “Sunken Treasure” and “Misunderstood,” and a few old Uncle Tupelo songs (“New Madrid,” “The Long Cut” and “Gun”). A live radio session includes a moving cover of The Shirelles’ “Will You Love Me Tomorrow,” played mostly on piano. Tacked on to the end of the final disc, it feels like a hidden gem here. Finally, the second set of outtakes, which fill Being There’s third disc, can be separated, generally, into two groups: alternate takes of album tracks and unreleased songs that largely sound like Tweedy’s solo demos. The former don’t offer a lot to the listener beyond a peek behind the curtain (with the possible exception of a lean and mean “Dreamer in My Dreams” and a version of “Monday” with the horns cranked up). The latter, though, are notable in that they capture Tweedy in his late twenties, learning how to be a songwriter. “Late Blooming Son” is a roiling acoustic rambler. “Sun’s A Star” is a sweet little love song. In “Losing Interest,” Tweedy grapples with dwindling passion for his craft. But the peak is “Dynamite My Soul”—two minutes of fingerpicked guitar, off-kilter lyrics, a gently undulating melody and nothing else. It sounds like the folksy kind of stuff he’s been writing for some of Wilco’s more mellow albums in recent years. If you close your eyes, you can probably picture a young Tweedy sitting somewhere playing it into a microphone, only to have it sit on a shelf for 20 years. It’s a good reminder that there’s been a single human being at the center of Wilco’s world all this time. No matter what Wilco has looked and sounded like at any given time — country-rock band, industry innovators, pop group, political activists, noisy experimenters, touring juggernaut — the whole thing is anchored by Jeff Tweedy and his songs. It’s been quite a ride.